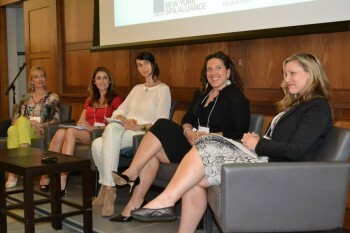 I recently moderated a panel on marketing health and wellness to consumers at the New York Spa Alliance. As is often the case at spa industry events, the “pampering vs. wellness” debate popped up. 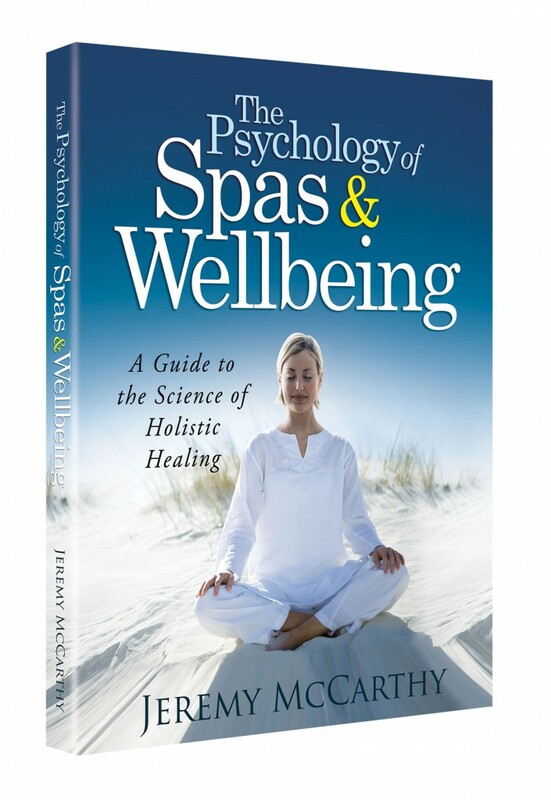 Is pampering an important part of wellness? Or should spas avoid referencing pampering at all cost lest they be perceived as a luxury indulgence? Both sides of the debate were represented in the forum. 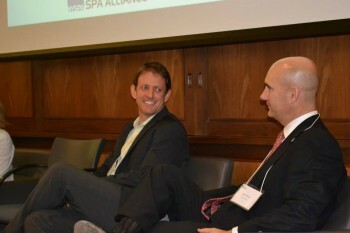 At the conference, Todd Walter, the CEO of Red Door Spas, showed some interesting research from the International Spa Association suggesting that spas do a good job of marketing to consumers around the top two themes that they are looking for in spas: relaxation and stress relief. But the next three consumer desires were underrepresented in our marketing: pampering, indulgence and escape. This is what consumers are looking for, but spas don’t want to market this because it sounds too frivolous. Spa and wellness consultant, Mia Kyricos, who was also on the panel, said wisely, “My wellness needs are different every day. One day I might know I need to eat better or exercise more. But some days I might just feel ugly and the best thing I can do for my wellbeing is a beauty treatment. Or maybe I just need to do something that feels good.” Wellness is personal, and there are many paths to achieving it. Pampering is not only about indulgence. Sometimes, it’s just what the doctor ordered. Jeremy–this is great food for thought. You’re right–people are afraid to make a treatment sound like it’s for pampering-purposes. Also to your point, I agree that most menu write-ups now focus on showing the physical benefits of a service, whereas at first (when spas were becoming popular and more common), they’d try to make the treatment sound relaxing and luxurious. I believe the downturn in the economy played a part in this. Clients I’ve spoken with said they felt guilty and selfish spending money on something they felt was “frivolous” and didn’t show tangible results. Similarly, they felt more comfortable giving a gift certificate to someone else for a spa service than they did spending this money on themselves. That being said I think in all things, the pendulum tends to settle somewhere in the middle. Giving yourself a break from every day stressors and having a bit of time to tune into yourself are so vital to our health. Especially nowadays when technology has enabled, and created a desire for instant gratification and people are trying to match that speed and productivity. I must admit, when I first heard the word “pampering”, it felt an instant resistance to it. Why? because to me it means an indulgence. A luxury I do not NEED. An extravagance rather than a healthy albeit fun choice. I think my worker/doer bee got into a sting over the true meaning of that word. What do I NEED vs what do I CHOOSE to do for ME. It was me sparring with the professional vs personal. Very interesting. I would love to have been on that panel. What fun to ponder. When I mindfully sat back and observed my immediate negative response, my feelings became clearer. I was too defensive re: what I need vs what I want. Truth be known, I realize I use massage for therapeutic value but also pampering. I never had given that thought wings till now. Weekly massages literally saved my life 13 years ago after a bad car accident. I have chronic pain and scar tissue that bites and can’t sit for a long time. I am forever to my massage therapist who I have had for 15 years. She helps me immensely. Massage to me is a necessity and perhaps pampering, but personally that is not the word I would like. I forgot to mention how much I enjoyed and related to your phrase, “vital to our health”. Denise, you are right, the economy has a lot to do with spas turning away from pampering and indulgence as people are worried about being labeled a luxury during tough times. I paused to ask myself what my internal dialogue was. It was, “You are going to Italy and Croatia in July. You can save the $75 and spent there.” Interesting. As if it was a choice of either or. What IS the value of my time? Then I wondered if men in general go through this same bargaining. Do you know about the research on this, Jeremy. Entitlement? Self Care? Luxury? Do they question spas as a luxury vs self-care? Love the connection to Willpower as mine is at the top! I can delay gratification with the best of them. Blame good thing I love being a coach and feel so much joy watching others soar to wellness and happiness, too. Thanks for your ever-inspiring wisdom, Jeremy. Judy, thanks for your vital-to-our-health mention. To Jeremy’s point about the pampering paradox, it’s so funny because I’m absolutely one of those people who feel like I need to be doing something productive, all the time. And yet I’m completely aware of the need to just “be” with myself and how productive that is in the grand scheme of things. On top of that, you’d think that by working in the spa industry I’d perhaps be a little less Type A…interesting. 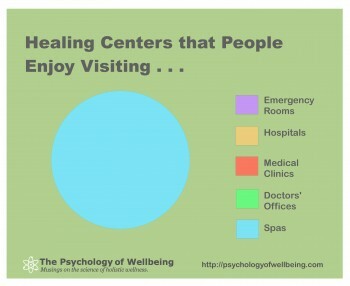 As an aside, I just noticed the pie chart above which shows “healing centers that people enjoy visiting”. Hilarious! Yet so true. As I looked at that, I found myself thinking about how most people probably don’t view spas as a healing centers. Which takes us back to the whole pampering vs. wellness discussion, I suppose. A never-ending circle! I love knowing you and I are in the Type A club and smiling in awareness. I love being an “A”, too. Life is always filled for stuff for me to savor. When my son was born, I looked at his incubator. It had “A+” on it. I teased the nurse he got the top grade in the nursery not to mention was a chip off the old Mom block for personality:. She roared. His blood type was the same as mine. 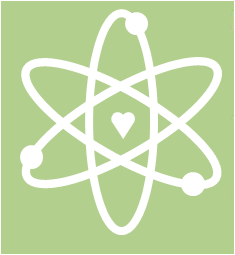 Spas as the only healing centers is brilliant marketing based on truth. BIG TIME will be when insurance companies finally comprehend WELLNESS saves them money! I hope I live to see it, not that spas would want to enter that nasty arena as we clinical psychologists know. it took us years to fight Washington to get insurance coverage, only now to have coverage less and less. Sad. but I digress. I also agree about the gift certificate. I once received a hefty spa gift certificate to the American Club in Kohler WI about 40′ from here. I never could find a time that worked. I gave the several spa treatments ( hold on, you will love this) to my massage therapist. she was thrilled as she had never been. It was a win win. At my age now, you bet I would find time to go, but 15 years ago, I was hell-bent on working all the time but was always happy doing it. Now I FEEL life a whole lot more. I enjoy mid 60’s wellness and hope and pray to keep it that way. I hope working for the spa industry is fun and rewarding, Denise. A secret fantasy I have always had would be to be a spa tester. To go to spas all over the world and report back on the treatment. Talk about a dream job! GREAT discussion. Jeremy you are a blessing to the Spa and PP arenas.